Andrew Innes was recruited by childhood pal, Creation Records majordomo and fellow Glaswegian Alan McGee to join Primal Scream back in 1986. He arrived just in time to rescue the band’s traumatic recording sessions for their much-maligned debut album Sonic Flower Groove from drug-induced band implosion, wilful self-sabotage and producer purgatory. The ace guitarist, reformed party animal and studio wizard has been a Primal Scream mainstay ever since – frontman Bobby Gillespie’s trusty lieutenant, the band’s shadowy secret weapon and generally their resident genius. ZACK YUSOF caught up with Innes on the eve of the Scream’s upcoming Australian tour to get the lowdown on one of the UK’s most enduring bands. Primal Scream bring their incendiary live show to Metropolis Fremantle next Thursday, February 15 where they’ll roll out an all-encompassing greatest hit set including tracks from 1991’s legendary Screamadelica. 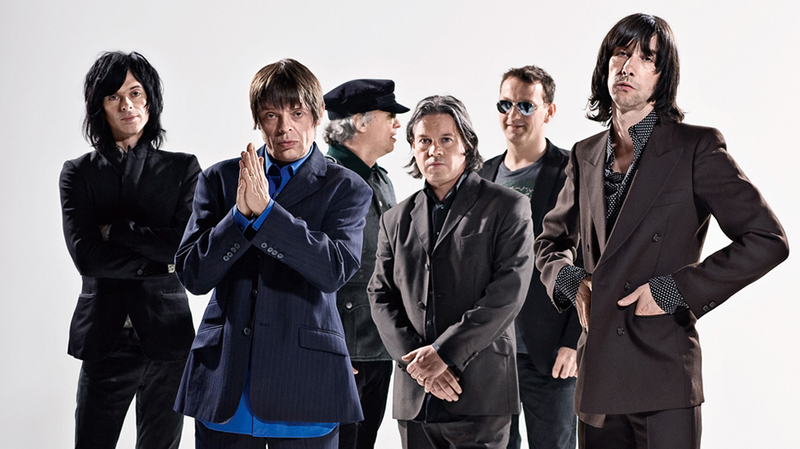 Is it still exciting being in Primal Scream after all these years? Yeah, it’s still exciting to be in the band. That’s why you keep doing it. Besides, I wouldn’t know what else to do now. I can’t see myself getting a proper job anymore (laughs). So yeah, it’s definitely still interesting. You always come up with different things to do. It’s just how you are; you get up in the morning and you try to make music. That’s how it’s always been for me. Do you think that you guys have mellowed now that your legendary hedonistic days are behind you? I guess as you get older, it just takes you that much longer to recover from a night out. You really don’t feel better until a few days after. It’s not like it was when you were in your 20s where you could just keep on going. So it’s your body telling you that you can’t carry on like that. And also, there’s not too much to miss about the party side of being a musician really. Being a musician isn’t about that; it’s about making music and that can be done no matter how old you are. So as long as you’ve still got that buzz about creating new music – which we definitely do – and playing live and as long as you’re not up there thinking, “I might as well be working in a 7-11,” you just keep on doing it. For the two hours that you are up there (onstage), you’re thinking,”this is the best thing that could ever happen to us.” If that feeling left, then you’re in trouble. Now that you are no longer the hard-living band of before, is it easier to write and tour now that you are more together? We made an album called Vanishing Point back in 1996 and that was the point where we worked out that it was better in the studio with a clear head. So I’ve been working that way for over 20 years now. The other way that you were talking about maybe only lasted for two albums so I’ve actually made more records sitting in the studio with a clear head then the other way round. That’s the way it’s been working for me for a long time now. Even with Screamadelica, we’d have a great time on the weekends and then make the record on the weekdays. It’s very hard to be off your head and make good music because you don’t know if it’s any good or not. The only time you can judge things properly is in the morning when you are fresh. Primal Scream have always been quite a political band, and given how things are so fucked up on the global political front at the moment, is not the perfect time for another angry Primal Scream record? I don’t know. We’re not dwelling on it. You see, I’ve had this conversation before. Every time we do an interview, somebody goes, “it’s a fucked up world.” It was a really fucked up world when we put out XTRMNTR (released in January 2000 as the last album put out on the now defunct Creation Records label). Screamadelica came out to a fucked up world – after 10 years of Thatcherism – but it came out as a sort of joyous rebellion. I really don’t know if it’s any worse now. I just watched a great TV documentary about the Vietnam War, a 10 part series. Anyway, I remember the tail end of the war because it was on the news every night. I must have been about 10 or 11. I remember all the stuff being on the news and thinking, it’s an extremely fucked up world. You watch a series like that on Vietnam and think, is Trump really worse than that. Or does Trump just seem worst because it’s happening right now? Myself, I don’t know if he’s any worse than Nixon and what he got up to. Definitely what Thatcher and Reagan got up to was pretty horrific as well. Yes, it’s could time for another angry record and you can shout and bawl but musically sometimes, it’s good to bring a bit of escapism because it’s meant to be entertainment as well. Primal Scream are coming back to Perth this month. What kind of set can we expect from you guys? Will there be any new material? Aw, I don’t really want to say. You’ll just have to wait and see. A good magician never reveals his tricks! With regards to new material, we’ve been working on some stuff but it’s not fully formed yet. We have some ideas and we’re getting there. You know, I said it at the time, when you have Robert Young on your side, you felt like you could take on the world. He was strong, he was soulful, a great guitar player, a brother, a friend… I still miss him.